Dr Bhimrao Ambedkar pursued an English-medium higher education, but he was politically too aware to advocate expansion and popularization of English language in a country like India. Almost the entire Indian political leadership of the British era had received an English-medium education and Dr Ambedkar was no exception. At that time, the Indian leadership was faced with twin challenges: One, to address the British rulers in English, as that was the only language they understood, and two, to communicate with the common man, most of whom had never seen a classroom. Gandhi also had a clear understanding of the issue. Though he was a Gujarati, he preferred to speak in Hindi and used it to interact with the masses. Had Gandhi addressed the people in English, he would have never won the nationwide acceptance that he did. In the Indian context, the issue of language should be studied and discussed by dividing it into two distinct phases – colonial India and post-Independence India. After Independence, the government was under pressure to use only Indian languages for official business and to make arrangements for having these languages as the mediums of instruction in education. This was a political programme. The power structure was pro-English but the leadership was forced to communicate in the Indian languages with the understanding that sooner or later it would have to abandon English for good. The essence of political change lies in power transforming itself to meet popular expectations. And power wants to mould the leadership in its cast. It is necessary to understand this duality of politics. The transformation of power in keeping with the aspirations of the people involves the ruling classes being forced to understand the language of the consciousness of the people. That is why when a particular language is adopted, it’s not because of its script. This is linked with the political, social and economic base of power. Dr Ambedkar is wrongly projected as pro-English. He had a clear political view as far as the issue of language is concerned. This is apparent from what he said during the debate on the reorganization of the states along linguistic lines. In fact, his articulation is so clear that there can be no ambiguity. During the debate, Ambedkar said that even if the demand for linguistic states was accepted, a Constitutional provision should be made to ensure that the official language of the Centre automatically became the official language of all the states. Only on this condition would he accept the demand for linguistic states. He was also clear that the official language could only be Hindi. He said that English would continue to be used till such a time the country was ready to switch over to Hindi. Thus began the political struggle to build a new language for the people of the country and to force the power structure to abandon its language. Consider also this: the political objective was to increase the acceptability of a language, Hindi, among a people who would also have accepted Gujarati and Marathi. On the other hand, we have to keep in mind that those in power and the ruling class were bent on blocking the political process of building of a common language. Without going into the details, it can be said that while on one hand there was the political programme to create a single, Indian version of Hindi, on the other, there were politically motivated efforts to throw it off the track. Look at the process of how the Hindi language was built – a simple language was turned into a complex one. This complexity was part of the politics to protect the language of the ruling class and to hamper the process of the making of a language. The Sanskritization of Hindi was, in fact, an attempt to block the process of making it acceptable to all Indians, just like the political programme of Anglicizing the language post globalization. 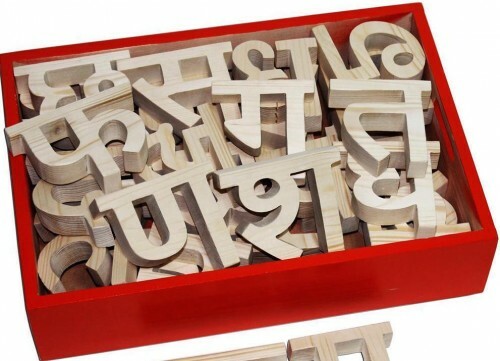 Thus the objective of expanding Hindi by borrowing and assimilating words from Marathi, Telugu, Gujarati, Punjabi, Bangla and Kashmiri remained unfulfilled. Instead it was developed as the language of the ruling class, the replacement of which was pre-decided. Thus, Sanskrit was replaced by English as the language of the ruling class. There was consensus in the ruling class regarding the language, which manifests itself in political processes. Ambedkar did not publicly discuss the issue of language because his priority was addressing the British rulers and the Indian leadership of the Congress. He was the most powerful advocate of the rights of the common man. But he was not in any kind of dilemma about the use of language as a political tool. He came up with the slogan about getting educated but he never said that Dalits should study only English. But just as Ambedkar’s call to get educated was narrowed to mean only accumulating degrees and certificates, English was promoted among the Dalits as the language that would benefit them. The battle for establishing the language of the deprived classes lost its way. Complicating the issue of language serves the political ends of many forces. It has been a challenge to the deprived sections of society to use the power of their language to quicken the pace of gaining power. Ensuring that their representatives are Anglicized has never been their political objective. To create circumstances in which the rulers of the country can be addressed in one’s own language and brought to the level of one’s consciousness of language – that’s what a language has been associated with. What we find in the present circumstances is that even though the British have departed from India English continues to be the language of the economic, political and social power structure and has become a necessity for democracy. Why did the ruling class try to intensify the race for acquiring an English education after the implementation of the new economic policies? It freed itself from the language and consciousness of the deprived sections. It promoted the habit of talking about policy issues related to the common man only in English, thus limiting the participation of the deprived sections in policymaking.